Are You Ambivalent About Pregnancy? Join the Club. For the longest time, women have been portrayed as automatic mothers, that, simply because most women are "made" to make babies, all of us want to. Then voices cut through schooling the world that, hey, wait a minute: Plenty of women don't, in fact, want babies at all. But left out in the cold in this either/or proposition is the fact that lots of women simply are not sure either way. It is the more interesting aspect of the recent online discussion about women who are ditching the pill for the pullout method (which doesn't seem like news at all but rather How People Have Done It for Ages). Ann Friedman has a piece over at The Cut about a new book, Sweetening the Pill, which details the woes of using hormonal birth control. In the piece, she introduces a "pullout generation" of women who are content to use a less-than-perfect method of birth control — AKA, the withdrawal method — if it means not having to put up with all the hassle/side effects/issues of proper birth control. Pulling out is not new or anything. Wikipedia's entry on ye olde "coitus interruptus" says it's been widely used for "at least two millennia," and cites research estimating that, as of 1991, 38 million couples worldwide were using the old what-the-hell approach. It's been said to be at least as effective as using a condom, thought that has been refuted with the assertion that condoms are being used incorrectly. 2011 research indicates that with "typical" use, condoms resulted in 18 unintended pregnancies per 100 people vs 22 unintended pregnancies per 100 with typical use of the withdrawal method. Can We Stop Shaming Women Who Practice Withdrawal Now? Perhaps what is new to many of us is reading that perfectly smart, educated women who live in big cities and have access to contraception and who know perfectly well how getting knocked up works — and the headaches it could cause — would use pulling out. Thirtysomething educated women should know better, right? Only dumb, poor people get knocked up accidentally. But over at Slate, Amanda Marcotte brings up another big one: Maybe these people aren't really avoiding pregnancy. Meaning, all this depends on what you mean by unintended pregnancy. The research team looked at questions relating to pregnancy ambivalence and contraceptive use, and their findings are quite startling. About 45 percent of respondents exhibited ambivalence towards pregnancy, and men were significantly more likely than women to be ambivalent (53 percent of men compared with 36 percent of women). People who expressed ambivalence about pregnancy were more likely to have used no birth control method in the past month. For these uncertain folks, she writes, it's simply "easier to just be inconsistent with contraception or switch to less effective methods and let fate make the decisions for you." The CDC says that about half (or 49%) of all pregnancies are unintended. And those aren't all teen pregnancies. In fact the largest percentage of those occurs in women aged 18 to 29. But we also know that while many unplanned pregnancies may be challenging, they are often still welcome surprises. So then, a broad directive — use contraception until you are ready to become pregnant — is a great idea in theory, but simply doesn't apply to the vastly different desires and circumstances of couples. 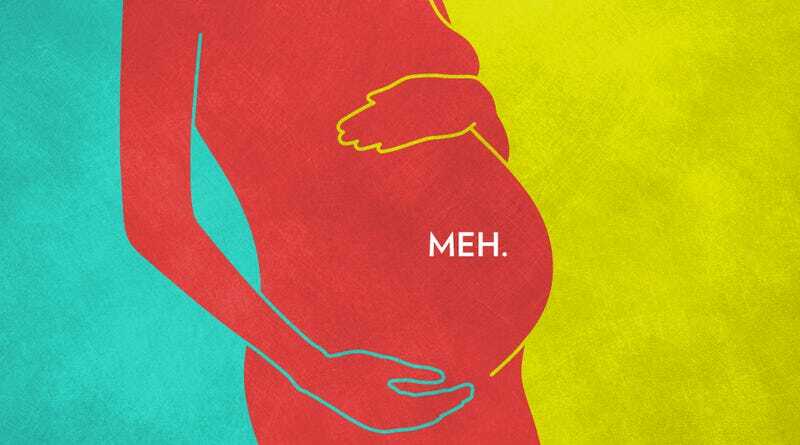 In a perfect world, we would all know exactly how we feel about pregnancy and it would remain a constant. We would all use birth control until the time was just right — and that time would be crystal clear — then we'd go off birth control, become instantly pregnant, and live happily ever after thanks to our unwavering insights into our future selves. But that's just not how it always goes. And viewed in this light, pulling out shouldn't be automatically stigmatized, but rather, understood in the context in which it is being used. It's not always "Russian Roulette" in a relationship wherein you trust your partner and aren't at risk for STDs — it's a gamble, but one for which it's entirely possible you are reasonably prepared to deal with not becoming pregnant or becoming pregnant. No one is saying that we shouldn't encourage pregnancy prevention or the use of birth control, and especially the CORRECT use of birth control, merely that there's another reality in here: that people don't always know how they feel on this subject. The circumstances and desires of the couple are not always so clear cut. Researchers on pregnancy ambivalence say the goal is to "help [couples] clarify their feelings about pregnancy, even if those feelings are messy and complicated." In moving beyond a “pregnancy prevention” frame and encouraging open dialogue about the many emotions that pregnancy brings up for both women AND men, we can engage and empower both partners to be active participants in reproductive decision-making. That sounds a lot more realistic.